Approaching the end of financial year presents a unique opportunity for small business owners to plan for and take action to minimise the income tax payable for that financial year. As many small businesses operate using a company or trust structure, this article explores some of the considerations as well as some important requirements when making distributions or paying dividends. Distributions are the allocation of income of a trust to a particular beneficiary. A significant benefit of a discretionary trust is the discretion available to the trustee to distribute the income of the trust to the beneficiary of their choosing. To achieve the best tax outcomes, the trustee could choose to distribute income to beneficiaries with low or no income to utilise their tax free thresholds and lower marginal tax rates; to companies to cap tax at the 30% company tax rate; or could stream capital gains or franked income to beneficiaries who will benefit most from these certain classes of income. You need to ensure that any resolution you make to distribute your trust’s income for the year is made in accordance with the terms of the trust deed. Resolutions to distribute income must be made by the end of the income year (usually 30 June) or earlier if your trust deed requires. If you wish to stream franked dividend to a particular beneficiary, you must record this decision in writing prior to 30 June. If you wish to stream capital gains to a particular beneficiary, you must record this decision in writing prior to 31 August. If you do not comply with the requirements relating to distributions, that is, those included in your deed as well as those required for tax purposes, your distributions may not be valid. The result can be that distributions instead go to a default beneficiary, or that no beneficiary is entitled to the income of the trust, in which case the trustee is taxed on the income at the top marginal rate of tax. Dividends are the mechanism in which companies can distribute their earnings to their shareholders. 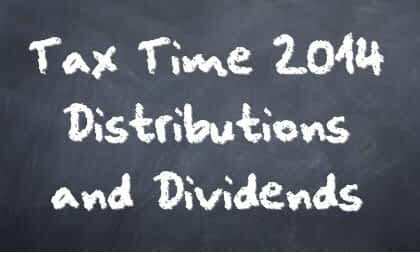 Dividends can be franked, which means they have a tax credit attached to them for tax that the company has already paid, therefore reducing any tax payable by the shareholder. The tax profiles of the shareholders who will include the dividend in their assessable income. Loans made to shareholders and their associates, and the Division 7A implications of those loans. The proposed future change to the company tax rate. The proposed changes to the individual tax rates, the increase to the Medicare levy and the introduction of the budget repair levy. The tax profile of shareholders is a significant consideration when considering the payment of dividends. If shareholders are individuals with high incomes, there may be an additional taxation liability incurred by the payment of dividends, this is known as top-up tax. It is essentially the difference between the individual shareholders marginal tax rate and the level of franking credits attached to the dividend. Alternatively, if the shareholders are individuals with low incomes, they may be eligible for a refund of franking credits included with the dividends. For example, if an individual received a $7,000 fully franked dividend, and it was their only income for the year, they would be entitled to a refund of $3,000, being the franking credits attached to that dividend. Loans made to shareholders and their associates from private companies are known as Division 7A loans. These loans, as a result of Division 7A of the Income Tax Assessment Act, can be deemed to be an unfranked dividend (taxable income) if certain conditions are not met. To avoid the application of Division 7A, a company may instead declare a franked dividend to repay the loan to the shareholder. Whilst the franked dividend is also taxable income, the shareholder would benefit from the attached franking credits. To avoid the application of Division 7A, the loan can be put onto a loan agreement with interest at certain rates and with prescribed minimum repayments. A company may decide to pay dividends to meet the required repayments of a prior years Division 7A loan. The government has announced that it intends to reduce the company tax rate from its current level of 30% to 28.5%. Whilst this is a benefit to the company, it also has a negative impact on the shareholders of the company. When receiving franked dividends, a shareholder pays tax at their marginal tax rate and receives a franking credit at a rate of 30%. If the company tax rate reduces, the flow on effect is that the franking credit attached to dividends will also decrease. As a result, the top-up tax payable by the shareholder will increase. As a result of the change in company tax rates, you may wish to consider bringing forward the payment of dividends to take advantage of the ability to frank dividends at the rate of 30%. There are two changes to individual tax rates commencing 1 July 2014. These are the increase in the Medicare levy from 1.5% to 2% and the budget repair levy which is charged at a rate of 2% for individuals whose taxable income exceeds $180,000 and will apply for three years from 1 July 2014. Depending on the tax profile of the company shareholders, it may be beneficial to bring forward the payment of dividends to avoid these additional levies being charged on the dividend income of the shareholders. If you are considering, or required to make distributions or pay dividends, then there are many things to consider prior to 30 June 2014, so you will need to act quickly. In addition to these considerations, there are likely many other tax planning strategies that you may be able to take advantage of prior to 30 June. If you would like further information on the matters outlined in this article, or any other taxation matter, please do not hesitate to contact us.